It is the fence that most homeowners don’t even consider. It is the fence that gets a bad rap for seemingly no reason. It is the fence that we have before referred to as the ugly duckling of the fencing industry. But despite all of the negative press, Chain Link Fences are some of the best fences on the market today. Low Cost: If you need security and don’t have a lot to spend, chain link is the way to go. These fences are very affordable, especially when compared to vinyl or wood fencing. Low Maintenance: You live a busy life. You do not have the time to clean a fence, paint a fence, or stain a fence. You just want a fence that will do its job without you intervening. Once again, chain link is the way to go. Unlike wood fences, chain link is low maintenance. There is no painting, staining, or cleaning required. 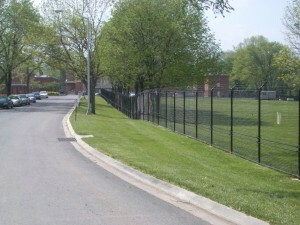 Durability: Chain link fences are made from galvanized steel and built to last. Security: Your new chain link fence will provide you the security you so desperately desire. Surprisingly Privacy: Add a few slats, and your chain link fence adds privacy to your yard that you didn’t think possible with this type of fencing. If you are interested in learning more about chain link fences and you live in Northern Virginia, Hercules Fence is the company for you. Not only have we been providing professional fence services and installation throughout Northern Virginia since 1955, but we are also the largest fence company in the state. This allows us to lower our prices, without cutting quality. That’s what we like to call a win-win. Hercules Fence can handle all of your residential fencing needs, from Custom Wood Fences to Ornamental Steel Fences to Ornamental Aluminum Fences to PVC Vinyl Fences to Chain Link Fences and we are more than happy to answer any questions you might have. If you have any questions about Chain Link Fences in Northern Virginia, please contact Hercules Fence of Manassas, Virginia today by calling (703)551-2609 or visiting our website. Also, check out Hercules Fence of Manassas on Facebook,Twitter, Google+ and YouTube! This entry was posted on Friday, October 25th, 2013 at 1:58 pm. Both comments and pings are currently closed.